This project stems from boredom, while staying at home and browsing the internet. 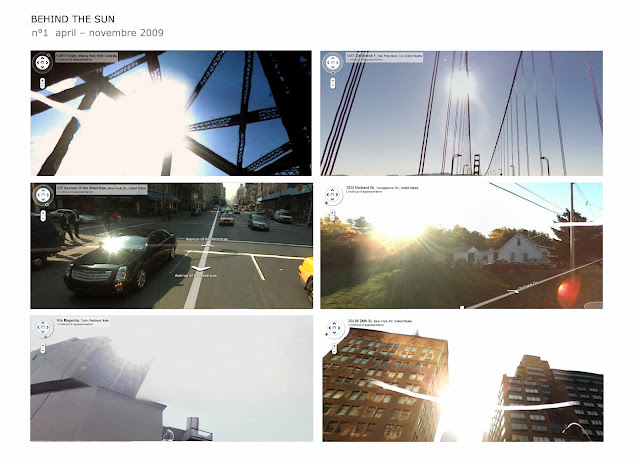 The images have been captured from the computer program Google Street View, and, transformed into slides, get projected in the exhibition space, to then create a visual shortcut. The computer program allows me to see and go through the different roads of the world. It virtually takes me into different countries, which for simple geo-political reasons I physically cannot reach. The states which permit their territory to be seen using Google Street View are only a few, thus censoring our sight. The place I am looking for and I have consequently captured are places where only the reflection of the sun appears, creating empty points.